Our timing was perfect. The move from dry rocky southern California landed us right in the middle of record-setting rainfall in Tennessee. Seven inches the day the horses came in. And it rained for days prior to their arrival. Gail Murphy’s Personalized Equine Transportation Service has a reputation for never being late, but on this day they were. The rains slowed them to a crawl causing them to arrive after dark. Which is when we learned that the turn onto our road was too tight for their rig to make. We had to shuttle the horses off the transport trailer onto our 3-horse trailer which had to be pulled by a generous new neighbor with his 4-wheel drive tractor because my truck would’ve been mud-bound for sure. Noelle, our new mustang, went into a paddock in front of the barn and the hillside herd of five got the paddock behind the barn for the night. We didn’t think it wise to turn them out on a steep unfamiliar muddy hillside at night. Is that another one of those human things like blankets in the snow :). They hadn’t been out of the trailer for ten minutes when every one of them began to wallow in the mud like little pigs. And through it all I could only think about what all this wet and mud might do to their beautiful, dry, rock-solid barefoot hooves. Everyone was in fine (however muddy) shape the next morning. Noelle, our mustang who had not been with the herd as yet, was thoroughly enjoying being just over the fence and everybody seemed quite relaxed for being in such a strange place after traveling more than 2000 miles across the country. We checked the footing on the smaller of the two pastures, the one closest to the house, and decided to open the gate let ‘em have at it. It was definitely an YeeeHaaww moment. Cash, my co-author and cover boy, trotted through of the gate and without ever looking back broke into a full run up the steep hill and off toward the house. Within moments the other four were right behind him. Running, romping, and kicking up their heels! It was something to see. Poor Noelle could only hang by the fence and pace. And bellow at them. When the herd finally calmed down their joy escalated into disbelief . There was grass everywhere! I’m pretty sure that four of the five had lived their entire lives in the west and had never seen anything like this. They were fun to watch, but it was also more than a little bit scary. We had received numerous warnings that horses could not come here from the deserts of southern California and be out 24/7 on the very “rich grasses of middle Tennessee.” Too much sugar in this grass, we were told. Some had called the area “Founder Valley.” I was worried about it to be sure, but I had done enough study of horses in the wild to feel that something was amiss with the local logic. It’s more complex than just sugar in grass. All grass everywhere in the world generates sugar. Can soil alone cause an over abundance? And how much does lots and lots of movement play into digestion and metabolism? Can supplements balance other things that if left unbalanced would be bad for the horse? And how much can stress from confinement and human-adjusted lifestyle play into metabolism imbalances. I didn’t know, but I was already researching to find out. 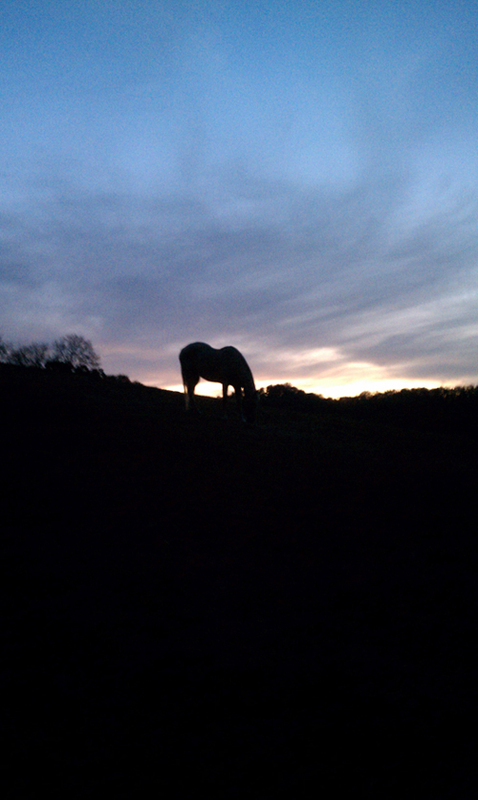 One of the points of moving here was to be able to truly let the horses live like horses. Like they were genetically evolved to live. And I wouldn’t give that up without knowledge certain. I was reminded of a piece I had read in a book about the San Diego Zoo’s adoption of two gorilla’s they wanted to mate. They fed the exact same leaves the gorillas had been eating in the wild, or so they thought. But the gorillas did not do well and did not mate. After a bunch of further research they finally discovered that when they were washing the leaves (so they’d be nice and clean) they were removing all the little bugs and microscopic life that were actually adding 10% to 15% animal protein to the gorilla diets. They quit washing the leaves and the gorillas got better immediately, and mated. So I was on a mission to “find the bugs” so to speak. 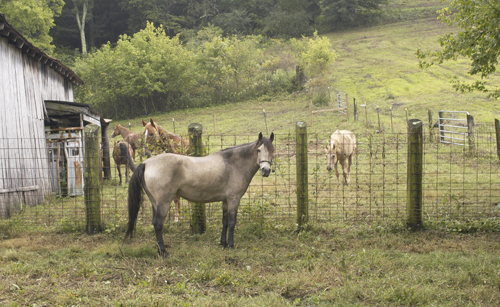 To discover why horses in the wild can spend their entire spring and summer on beautiful rich-looking meadows and do just fine, but horses (or at least some horses) in middle Tennessee can’t. The answers I found made an interesting study into the way we humans think. The first thing I discovered was that just when you think you have everything figured out God says, “Not so fast”. We simply didn’t count on moving into record rainfall. And tons of mud in the pre-selected morning and evening supplement feed zones. I’m glad the washer and dryer were immediately hooked up because I was sliding through a pair of muddy jeans a day! God just wanted us to know after so much complaining about the dust in California that the opposite of dust has its downside as well :). All the horses learned right away that water was now from a pond instead of a big metal tub. Skeeter immediately got into the swing and went almost up to his knees. Even Cash who especially hated mud drank his fill and it wasn’t long before Mouse leapt in belly first. It turned out to be the wettest fall on record in middle Tennessee. We had over 26 inches during our first six weeks. I was worried about their feet in such squishy conditions but that worry was trumped by the rich grass warning. I had to solve that issue. I had to find those bugs. I had already learned that wild horses don’t founder on grass. And some domestic horses do. And I was determined to find out why. Like the earlier story of the two gorillas at the San Diego Zoo, there had to be answers. And the logical place to begin is out there where there is no human intervention. Where no one is washing the bugs off the leaves. Out there in the wild. Eddie’s answer was, I thought, brilliant. Loaded with super information, analysis, and a road map of questions for further research. It follows. The underlines are mine. Joe – In the wild the grasses are native grasses…and unstressed grasses. Of course I realize there are times of drought but typically grasses left in their natural state handle such things quite well because they are going through the natural cycle they are meant to go through. They’re never mown down (other than naturally grazed, over time, each year), never overwatered, with no pesticides or chemical fertilizer, and not encouraged through genetic modification to grow in a season they aren’t meant to. Also the wild horse meadow is not just one kind of rich lush “genetically improved” grass, like all Orchard, or what not. It’s a mix. The horses have CHOICES. And the wild area is not lush and thick. Compared to many domestic pastures, wild meadow grasses are fairly scattered, which would help slow grazing and create more browsing… which helps the digestive system handle things more efficiently. Some native species of grasses are rich, others are not. And these “non-rich” grasses with lower starches/sugars can cut or dilute the sugar of the richer grasses. Every spring I see changes in my horses hooves…some rings, maybe they lose a little concavity here and there. Not enough to make them sore but I keep my two founder-prone ponies drylotted or they would show more damage. Why? Because our grass pretty much stays stressed. We have nothing but bright green little nubs of “candy grass” as I call it, since the pasture is overgrazed…I have too many horses on too small of acreage, so not much I can do other than keep them penned up the majority of the time which I hate doing of course. I trim for a few clients who have large 40-50 acre pastures, with just 4-5 horses and tall healthy grass. A small few will show some minor changes but the majority have no problems at all. At least the ones not being fed sweet feed. That’s because the grasses are healthy, and non-stressed, thus much lower in starch/sugar. And typically on larger acreage there are a lot of native grasses, not all one type as in small paddocks. Mustangs start to drop weight in the fall typically, after getting a great weight during spring/summer. This is as nature intended. They get lean after a hard winter with less forage, and what forage is there is dry and dormant. Then spring hits and the horses are more able to handle spring grasses because they need it coming out of winter. Many of the mares are in final stages of pregnancy, they definitely need it to get ready for baby. If they started out being fat and chunky after winter and were put on the spring grass this might be a much different scenario. Most domestic horses don’t need the rich grasses to “come out of winter” the way a wild horse does, which is why it can cause them issues. We keep them fed and fat through winter… and panic if they do drop some weight. What’s worse…we keep feeding them the same exact amount of grain/feed, alfalfa, etc. we were feeding through winter, PLUS now they are getting grass. I tell people all the time, if they are getting a lot of grass, you MUST cut back on everything else (really they probably need nothing else). But people still feed…asking them to quit feeding pellets or grain I’ve found is like asking them to give away their first born child. They look at you like you are plum crazy. Also, there’s movement in the wild. The mustangs are getting a lot of movement. A lot! This helps so much; is necessary! They aren’t being confined, they have good firm ground. They aren’t living on soft shavings or arena sand part of their day, aren’t getting grains, sweet feeds, or alfalfa, etc. And here’s something most folks never think about: Domestic horses, particularly those that are stalled during part of the night/day, tend to gorge when let out on pasture, even when it’s baking hot. Their inner clocks are amazing…they know when it’s about time for them to be caught up and taken back to their pen or stall and they’ll begin to “gorge” when they know that time is running out. As Spring began to flower in Tennessee and little green nubblets of grass began to come alive I was once again reminded by several people that our horses shouldn’t be out 24/7 on the “rich grasses of middle Tennessee.” These warnings ramped up my motivation to find answers to the puzzling question of why some domestic horses founder on grass. I was on a mission to prove or disprove Eddie’s hypothesis. Science confirms that it would take a minimum of 5000 years – probably closer to 10,000 – to even begin to change the base genetics of any species. In other words, a few hundred years of selective breeding has no effect on base genetics whatsoever. Which means that the domestic horse and the horse in the wild are genetically exactly the same. DNA sequencing was performed on bones of horses discovered in the Alaskan permafrost dating 12,000 to 28,000 years old and the results were compared to DNA sequencing from today’s domestic horse. There was less than 1.2% difference between the two. Again confirming that the genetics of every horse on the planet are the same, and that “every horse on the planet retains the ability to return successfully to the wild or feral state.” Note the scientists use the word: successfully. In other words, today’s domestic horse has the genetic ability to grow as perfect a foot and take care of himself with no help from humans every bit as well as those in the wild. Move a minimum of eight to twenty miles every day of his life in search of food, water, and staying ahead of predators. Living in a stall without this movement causes physical and mental stress to the horse. Eat tiny bits of forage – mostly grass forage – little bits at a time, virtually around the clock; a minimum of 16-18 hours a day, or more. Their tummies are tiny and not meant to eat two or three large meals a day, and their hindgut requires the constant passage of grass forage through it in order to perform and digest as designed. The horse’s digestive acid never turns off. The human’s digestive acid turns on or off depending upon the presence of food. In other words, the horse needs free choice grass forage or grass hay 24/7 or the digestive acid has nothing to work on but the horse himself. Thus, ulcers. Live within a herd. For safety, not for fun. There is safety in numbers. Separation from the herd creates emotional stress, and emotional stress attacks the physical body, and bad things happen. Have the dietary choices available to keep themselves healthy and strong. A horse’s genetics know what the horse needs and when. For example – when a horse needs a liver cleansing the brain will send him after thistle. When he needs vitamin E it might send him searching for a blackberry. Etc. If he’s eaten quite enough of high-sugar grasses, the hypothesis is he’ll switch to the low sugar grasses to balance. When humans attempt to perform these functions, it’s usually pure guesswork, and usually late, behind the curve. I sat on the porch and pondered these for a while. Clearly the more the domestic horse could live and eat like his wild counterpart the healthier and happier he would be. We had a pretty good start at this in California with our “Paddock Paradise” arrangement. They were never confined, were out 24/7 with the herd, and getting plenty of movement, defined by placing their hay in more than 100 small piles all the way around their 1½ acre hillside pasture. (See our Paddock Paradise video). Not what you would typically call a pasture. There was no grass. Just dirt and rock… and dust! But had we been able to add grass it would’ve been a microcosm of how horses live in the wild. At the time, I didn’t know how or what horses eat in the wild. I assumed that grass was grass. Off to Google, landing on safegrass.org and a study of What Feral Horses Eat by Kathryn Watts. Ahhh. Now we’re getting somewhere. Her study and several others found on the internet were pretty much the same, varying only by geographical availability. 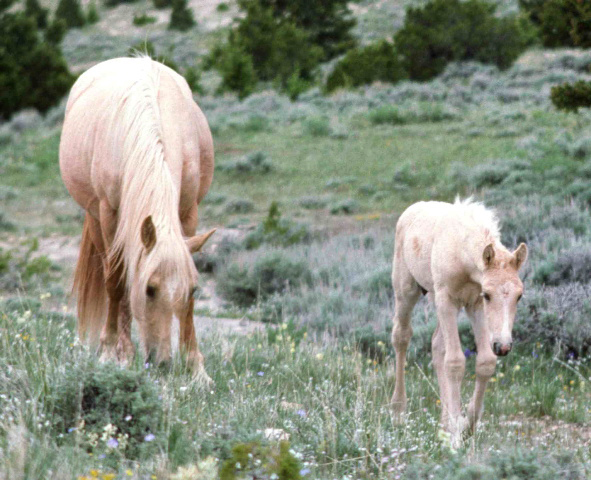 The conclusions were that wild horses eat mostly (80% or better) native and naturalized grasses of various species plus orbs (flowering plants and weeds), shrubs of various kinds, tree leaves and bark, and more. In other words, they have lots and lots of choices and they use them. Ms. Watts found that all the grasses in the wild contained lower sugars than any cultivated pasture grasses she’s tested. And some of the wild grasses contain substantially less sugar than domestic pasture grasses. Thus the hypothesis that the wild horse will balance his own sugar by eating both kinds of grass, along with those orbs, shrubs, tree leaves, etc. She also points out, as does Pete Ramey, that grasses in the wild tend to be “bunchy” or “patchy”, not in thick, tightly-woven carpets like so many domestic pastures. So the horse in the wild has to move more, cover more ground, to get the same amount of forage that a domestic pastured horse is getting. The wild horse is getting less grass per acre, thus less sugar per acre. And more movement which helps digestion and circulation. Plus he’s balancing his intake by what his body is telling him he needs. And he has a wide range of choices of forages to accomplish this as he goes about his day. I was beginning to carve away at the answer. Only it was obviously not one “answer,” but a whole bunch of answers. We all want this to be simple, but like so much of life, it just isn’t. There is not one big difference between the domestic pasture and the wild horse meadow that can solve the sugar problem. There are a lot of differences, and each one is important. Yet the bottom line is simple. Replicate the wild horse lifestyle and diet as closely as your situation permits and you will likely be good to go. And your horse will thank you. After digging into this for a while now I think I’ve found “the bugs on the leaves,” or rather they have become self-evident, and there are a bunch of them. Only a single species of grass and nothing else. No orbs, or shrubs, or weeds, or trees. Nada. One choice for the horse. Eat it or go hungry. That single species of grass is usually a “cool season” grass like orchard or timothy because they grow longer into the cooler seasons. Cool season grasses are much higher in sugar content than “warm season” grasses because the cool season grasses contain fructan. Fructan that can continue to build forever as long as there’s sun for photosynthesis. Warm season grass contains no fructan, only starch. Starch that is self-limiting because once the organ that holds it is full, production stops. Kathryn Watts has found cool season grasses to have NSC (sugar) percentages as high as 25+%. Warm season grasses are much, much less. 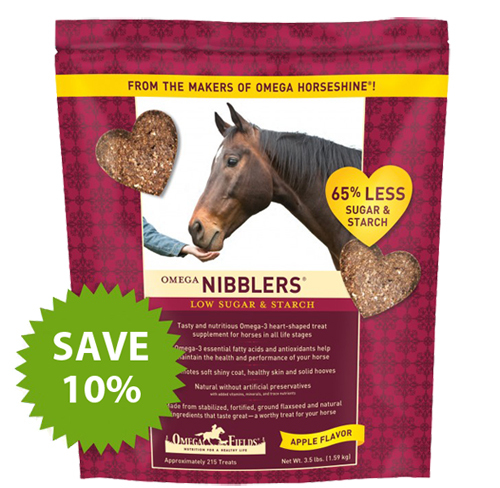 The generally accepted NSC maximum as a percentage of a horse’s overall diet should be 10% or less. That same single species of grass is usually a genetically modified species to make it heartier and grow longer into the cool seasons. Kathryn Watts’ studies find that genetically modified and “improved” grasses are consistently higher in sugar than any natural or unmodified species. The single species of grass in a domestic pasture is usually heavily fertilized with chemical fertilizer (to make it even richer, and thicker). Chemical fertilizer contains large amounts of potassium which in times of stress can be feeding the horse levels of potassium a thousand times the amount he should be getting. This can cause all kinds of internal problems. The single species of grass in a domestic pasture is also probably sprayed with herbicides to kill everything except the grass (plants and weeds that might be giving the horses some of the choices he needs). Note: Chemical poison of any kind, regardless of manufacturers’ claims, is not good for the delicate balance of the inner workings of the horse’s gut. The single species of grass is also probably sprayed with pesticides from time to time. Another poison. And, lastly, the soil itself can be worn down and depleted of needed nutrients etc when planted and replanted with only the same seed every year, and fertilized and re-fertilized exactly the same year after year. So I suppose if you’re looking for one big issue to hang your hat on, it would be the issue of choice for the horse. Lots of choices. Not just one species of highly fertilized cool season grass. But rather many species of grasses, favoring low sugar warm season grasses like Bermuda, and lots of other stuff. All scatter-planted in patches and bunches. Not wall-to-wall. I cannot emphasize enough that if your horse has the choices he needs he will make the right choices to balance his diet and thus himself. 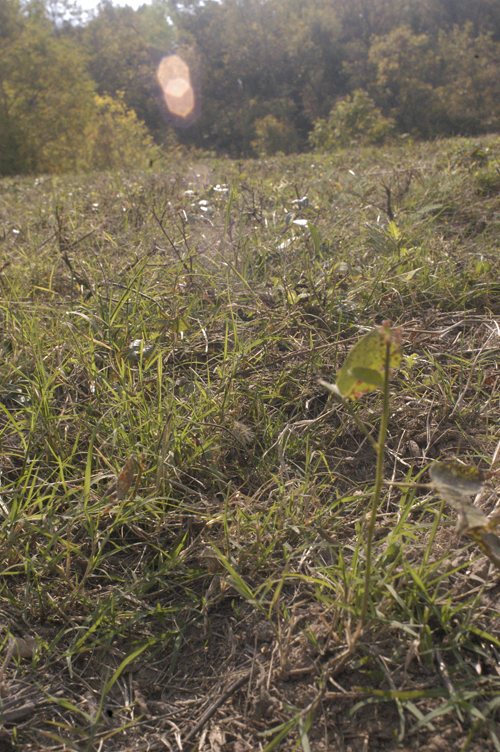 The perfect natural pasture for the horse will be ugly. Big time ugly. It will look uncared for. Not a nice, beautiful, thick carpet of a single species spreading out for acres. Below is one of Ginger Kathrens’ photos of the wild horse meadow atop one of the Pryor Mountains of Montana where Cloud’s band and many other wild horses hang out during the Spring and Summer. They head up as soon as the snow melts and don’t go down until they’re forced to by the onslaught of winter weather. From a distance it looks for the world like any cultivated rich green pasture, but it’s not even close. The horses have tons of choices to balance their own diets and apparently handle it all quite well. Not your pristine, manicured pastoral scene you would expect to see driving through Kentucky, or even our little slice of middle Tennessee. As I said, wild horse pastures are ugly with a capital “U” but are just what the horse needs. 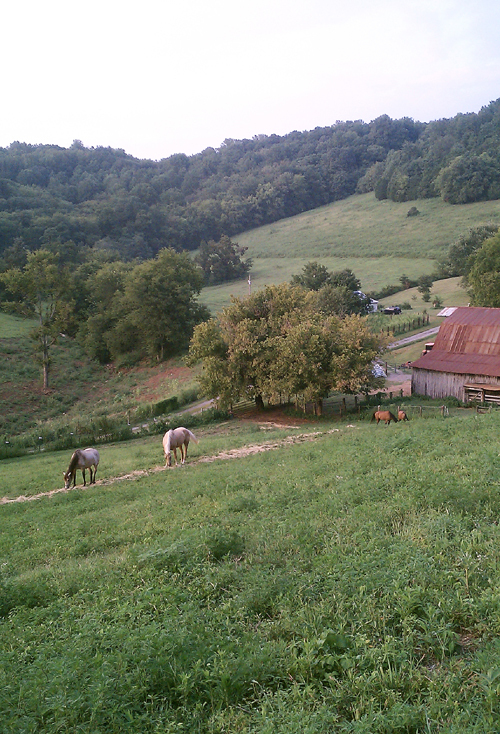 The following shot is our hillside pasture, up close and personal. It’s hard to discern but it contains at least some Bermuda, orchard, fescue, crab grass and various orbs and weeds. As I wrote this in October, our herd’s favorite delicacy was that flat seed of a weed that is covered in something like Velcro which sticks to anything that gets within yards of it. The horses come in with dozens of those awful things clumped in their forelocks, all over their faces, on their legs, everywhere! As I pull these pesky seeds off, the horses usually want to eat them out of my hand. Obviously there’s something there they need or want. If a horse is getting plenty of what he needs or wants, he simply will not eat something that’s bad for him. But if he’s hungry and something bad is the only choice he has he will eat it. How many acres per horse? The only answer I know is: it depends. We’re at approximately three acres per horse. Last fall, when we arrived, just after we had bush hogged maybe a third of it that had been allowed to grow wild with virtually no grass, and before we had sewn any seed, I was worried that the pasture wouldn’t be large enough. But after sewing a bit of orchard and a lot of Bermuda this past spring and summer, there was still plenty of grass in October. I think we’re going to be fine. For cutting we follow Melanie Bowles’ philosophy at the Horses of Proud Spirit Sanctuary. Nothing ever shorter than 4”, grass never longer than 12”. 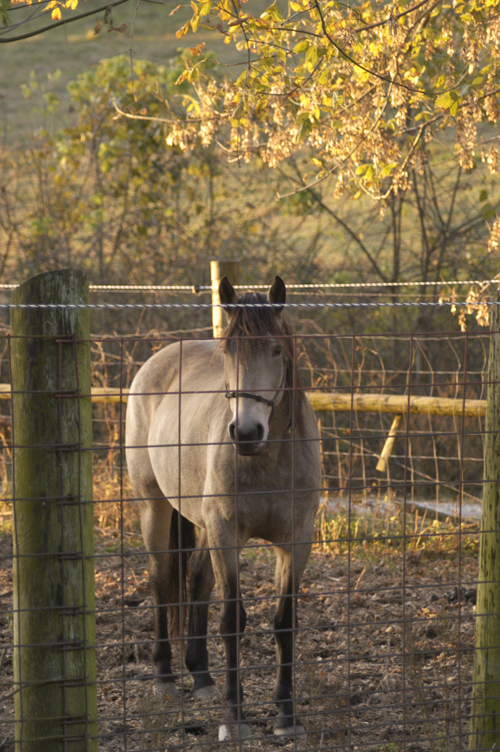 Our two pastures are both open to all the horses at all times. 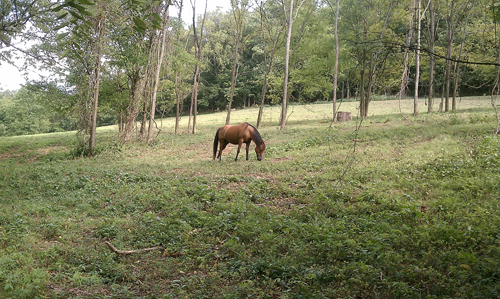 When we moved in, neither pasture had been fertilized for at least eight years. Of course I didn’t have sense enough to ask that question before we bought the property, but for reasons I have never fully understood, once again God was taking care of us. The population was mostly weeds when we arrived but we found that once it had been bush hogged there was quite a bit of native grasses underneath just begging for sunlight. You might recall that rain wasn’t an issue that first Fall. We planted maybe 50 pounds of Orchard at the tail end of the season. It was already too late for warm season Bermuda but I didn’t know about the difference in sugar levels at that time anyway. By Spring I was armed with research and when we started sewing the mix was heavily skewed toward Bermuda. Maybe a third of it was orchard grass. And now all of it seems to be doing very well. We continued to feed one bale of Bermuda hay a day during the hot season, split between morning and night, scattered over a long trail through the western pasture to help enforce movement and to add diversity as we attempted to build our “wild horse meadow”. The spring-fed pond is located on the far eastern end of the east pasture, which helps a lot with movement. It’s their only water source. So there it is. That’s what we’ve learned and what we’re doing. The logic of it all, as with so much of this journey, has left me wondering why in the world I didn’t see it before. But in any case, our horses are the beneficiaries. To change a “traditional” pasture to a “wild” pasture, I suspect, wouldn’t be as difficult or take as long as one might think. And it’s a whole lot easier to manage a messy pasture than to keep a pasture pristine. Stop all chemicals. Throw out (by hand) a lot of differing seeds trying to favor warm season grass or at least 50/50 with cool season grasses. Hike into the nearest woods and bring back some weeds, seeds of weeds, and brambles, and shrubs. Take the fences off your trees. And manage the pasture only by cutting. Grass does well with cutting, weeds do not. So if you cut with Melanie’s plan the weeds will not take over. They’ll just be a presence. Or so I’ve been told, and it seems to be working for us. And please remember, the object of all this is to be able to leave your horses out, living like horses, around the clock, 24/7, without worry about the amount of sugar your horse might be taking in. Or what that sugar might be doing to the health of your horses. To be able to let the horses monitor and manage their own diet and lifestyle instead of us micro managing their entire life. This is not to say that certain supplements might not be needed to cover deficiencies, which requires testing the grasses, perhaps the soil, observing the horses, and filling in the holes. But definitely cut out all processed feeds, all feeds with grain (sugar), and, of course, all sweet feeds. If you need added weight consider maybe a tiny bit of alfalfa, or rice bran (we use rice bran). Our herd gets a small amount of forage feed (Triple Crown Chopped Forage) morning and night and a few minerals and supplements top dressed (see our Diet page). But that is yet another topic. This one was all about what you can do to a sugar-unfriendly pasture to give your horses the lifestyle and health they were genetically designed to live, the lifestyle they deserve. For your horse’s sake, please put the bugs back on the leaves. September 17, 2017 will mark the eight-year anniversary of our southern California herd’s arrival in middle Tennessee. Our herd of six were virtually maintaining their own feet in California. Dani Lloyd trimmed every 8-9 weeks, usually doing little more than light maintenance. But they were moving 8-9 miles a day on the kind of terrain on which they are genetically designed to live . The trimming schedule changed in middle Tennessee. Mark Taylor is now trimming every six weeks and the hoof walls are always a bit long by trim day (except in the winter when most of the protein is going to winter coats instead of hooves). We find ways to ensure a lot of movement every day but the new terrain just doesn’t provide the wear and tear that they are genetically designed to get. Yet, because it takes 5,000 to 10,000 years to even begin to change the base genetics of any species, Mother Nature has no way of knowing our guys are not on terrain in the American West. She is still growing that hoof as if they were. So we have to help them along with the trim, with movement, and with quite a bit of pea gravel in their well-traveled areas like the barn breezeway, the round pen, and around the pond where they drink. But with all this, even three to four weeks after a trim, our 24 hooves look for the world like they looked when forged on the southern California high-desert type of terrain. As mentioned before, the feet were my big concern with the move to Tennessee. But the feet turned out to be the least of our worries. Several things popped up that our high-desert herd had never experienced before. Not the least of which was that Kathleen’s and my “humanness” always gets in the way. Like how difficult it is sometimes to stay on the horse’s end of the lead rope. To think about things from the horse’s perspective. Whether it relates to training or lifestyle. I’ll never forget standing out in the rain one cold October day in California, soaked from head to foot because the rain wasn’t expected. The temperature was only in the mid-fifties, but to me, sopping wet, that was freezing. I looked at our horses, heads down, dripping with water, and I just couldn’t stand it. I went for the halters and lead ropes and brought them into three covered stalls. The stalls were open, actually only half-covered, with one solid side facing the usual weather assault, but if we’d had a cozy barn with central heating and warm fuzzy pillows I’m sure I wouldn’t have hesitated to take them right in. Or cover them with blankets had there been any available. It’s difficult for humans, especially when cold and wet, to understand that the horses do not feel like we do. Or eat like we do. Or react like we do. Or live like we do. We want to believe that the horse will always be better with human intervention. Human “help.” How can they possibly make it without us? We were only twelve miles from the Canadian border. Winters are not warm here. I was amazed. The owner walked around the barn to show me a lean-to he had built which was attached to the side of the structure. Just a roof, with divided but open stalls, to keep the horses separated when eating their supplements. They had free access to this shed, but never came into it except for the feed. Again, I was amazed. This ran so counter to everything I felt for my horses. We want to think of them as children, or big dogs, and treat them in the same manner. They aren’t children, or big dogs. What sometimes seems too simple for me to grasp is the fact that horses have been around for all those millions of years, evolving to survive as a prey species, and those evolved genetics are precisely the same for every horse on the planet, wild or domestic. Given the opportunity they can take care of themselves. They’re built to do it. If not, we would have never heard of the horse. They would’ve been extinct eons ago. 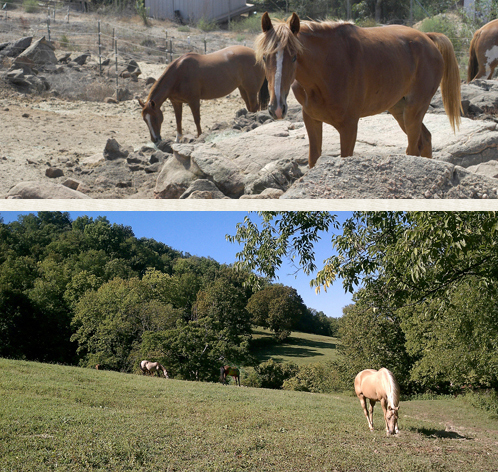 At both our former California home and the new one in middle Tennessee we have worked hard to mimic the wild horse lifestyle as closely as possible. But it never fails. Just when I think I’ve got it, when I’m certain I understand the concept…WHAP! Along comes a blow to test my faith. Last September Mariah quite suddenly went dead lame in her right front foot. With a pounding digital pulse. Couldn’t put any weight on it at all. An abscess! Apparently a bad one. Fear rushed in and faith went right out the window. It could’ve happened a few days earlier, before Kathleen and the twins returned to California to dig in for their last high school year. But it didn’t. No, it had to be while I was home alone. With no one to help, or soothe, or listen. I was frozen in place. I love that word from Watership Down. It’s rabbit-speak, and there is simply no English equivalent. It’s what happens when a rabbit gets caught in the headlights and is so suddenly petrified that he can neither move nor think. I was tharn. Our vast experience with horses – almost 4 years at that time – had never shown us an abscess. I was told gory stories of digging out all this gross-looking stuff with a knife and soaking the horse’s hoof several times a day. High doses of antibiotics. And all the terrible things that can happen if it’s not properly cared for. I was so tempted to violate my firm beliefs, my faith in Mariah’s systems and the wild horse lifestyle, and lock her up because she was obviously in a great deal of pain trying to walk and keep up with the herd. But keep up she did, wherever they went. It was painful to watch. I was told the vet should come and dig it out. At someone’s advice I tried soaking her foot in Epsom salts. But she quickly grew tired and annoyed with keeping her foot in a tub for fifteen minutes at a time and finally she said enough! Determined, she found them, and with each step seemingly excruciating, she followed them off to the grove (she’s last in the photo above). Deep down I of course knew that movement meant blood circulation and circulation meant healing but it was buried too deep for me to find and take comfort in at the moment. But remember this please: stalling a horse with such a condition is exactly the wrong thing to do. Mariah followed the herd all the way to the grove on the far end of the western pasture (above), between a quarter of a mile and half a mile away from the group photo above. Here she is surrounded by the herd, all just out of frame. With a long walk back to the barn. I had to quit watching her move. It hurt me too much. “Get a soaking boot. You have to soak,” someone said. I made several phone calls and went out and bought a soaking boot. When I arrived back at the house with the boot, there was an email waiting from Yvonne Welz, the amazing editor of The Horse’s Hoof. She said: Joe, when a horse has healthy hooves, abscesses are often here today and gone tomorrow! Just not a big deal. Yes, when the hoof has good blood circulation and lots of movement, the body just absorbs the problem area. Why do abscesses happen in healthy horses? Some sort of trauma or environmental cause, usually. Natalie Cruz of Shoe Free Performance Horses went a step further: The vets won’t like this but abscesses will heal themselves. The best thing you can do for your horse is give it a couple of tablets of bute a day for a week or so and baby the horse a bit for your own peace of mind. Keep the horse turned out so it can move which increases blood flow so the abscess either blows out or disintegrates inside the hoof. But check to make sure the horse was not kicked or otherwise injured, of course. If not, and the horse is suddenly dead lame on one hoof, it is usually an abscess. Take a couple of aspirin for your own headache and wait it out. But don’t allow anyone to dig it out! 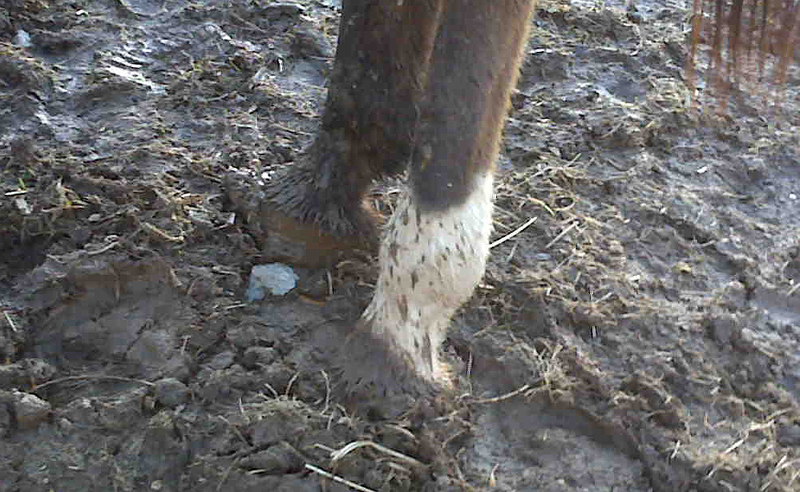 This is counterproductive to healing and can actually introduce bacteria into the hoof and cause problems! No need to wrap the hoof either. It just annoys the horse and doesn’t help its healing one iota. So drink a glass of wine and prop your own foot up instead. :) Some drawing products like Epsoms salt may help a little bit though I don’t use any of them. I had barely finished reading these when suddenly Mariah was better. Limping, but putting weight on the hoof. The next morning she was walking fine. A day later she was cantering down our steep hill with the herd racing to the barn for breakfast. A few months ago we had watched an abscess on Skeeter’s belly (caused by an allergic reaction) slowly disappear as the body dissolved it. Likewise my tharn-ness began to dissolve away leaving an embarrassed logic. Of course, it’s the blood circulation that does the dissolving. So why shouldn’t Mariah’s body do it’s job. She has terrific circulation in her feet because she wears no shoes. She gets tons of movement which increases circulation even more. Her diet is good. And her body is working as it’s designed to work. The verse Oh ye of little faith came to mind. The lesson? Nobody says it better than Rick Lamb: Give them as natural a life as possible. Then get out of the way. Anybody want to buy fifteen pounds of Epson Salt? During the first couple of years allergy problems from fauna the California herd had never seen before were probably the biggest issue. Soon enough the immune systems got a handle on all that. Cash had a ligament pull from sliding down the hill in the snow. There were a few pricks from thorny brambles allowed to grow too tall. All adding to the learning experience. But although the feet were my biggest concern when we headed to Tennessee, and although we went through two full years of record-setting weather, our herd’s feet were terrific. We didn’t see this issue the first Spring because they had been here only about six months and were apparently still adjusting to the move. But when the Spring grasses began to emerge the next year – cool season higher sugar grasses always emerge before the warm season grasses containing less sugar – the horses all blimped up pretty good. We missed it in the beginning because we are with them every day so I’m really thankful that Mark Taylor, our hoof specialist, was coming every six weeks. He spotted the extra weight immediately and we slowly but methodically cut way back on the rice bran. The next fall we let them go into winter with a decent weight but in January we started cutting back on anything that could add weight – watching and judging as we went – so they hit the Spring grass season nice and lean and were able to handle the higher sugars with less effort. Just like in the wild. So here we are marking the eight-year anniversary of our guys and gals being out 24/7 on the “rich grasses of middle Tennessee.” They’re a happy healthy bunch and Kathleen and I are mighty proud parents. As we stress in all of our books, please don’t take someone else’s word for how you should be caring for your horses just because that’s the way it’s always been done. Do the research yourself, dig out the answers, and don’t stop asking questions until the answers begin to make sense. Discovering the mysteries of the horse will be a never-ending journey, but the rewards are an elixir. Nothing can make you feel better than doing something good for another being. Not cars. Not houses. Not facelifts. Not blue ribbons or trophies. And there is nothing more important in life than love. Not money. Not status. Not winning. This is the synthesis of our books and why each one came into being. There are many who teach relationship, riding, and training with principles of natural horsemanship. Others support the benefits of going barefoot with the wild horse trim. Still others write that your horse should eat from the ground, and live without clothes and coverings. Some promote day and night turnout, where your horses can move around continuously. I’ve found none who advocate the essentials of a wild horse meadow in their pastures. And few have explored how dramatically one without the other can affect the horse and his well being. Few have put it all together into a single philosophy, a unified voice, a complete lifestyle change for the domesticated horse. When I gave Cash the choice of choice and he chose to trust me he left me with no alternative. No longer could it be what I wanted, but rather what he needed. What fifty-two million years of genetics demanded for a long, healthy, and happy life.